And despite the exclusive Irish focus of these posts, I’m also hoping TGISVP will prove useful & interesting for international investors – over the years, such readers have been kind enough to comment & email their appreciation of the wide variety of valuation techniques & perspectives I employ here across a really broad spectrum of companies. And I have to ask, if you’re not particularly interested in Irish stocks…well, why not?! Again, my Celtic Phoenix post highlights the fantastic performance the Irish market’s clocked up – blowing most markets out of the water globally, with five consecutive years of gains. 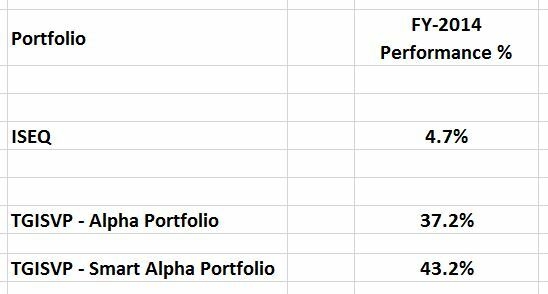 And notably, the gains on my TGISVP Alpha & Beta Portfolios have (generally) far out-paced the ISEQ itself – culminating in a magnificent 32.5% & 38.5% out-performance for my TGISVP Alpha & Smart Alpha Portfolios, respectively, in 2014 (full post here). All in all, a great sales pitch, eh..?! – An Irish Company: Any company which conducts a major portion of its business in Ireland, is genuinely headquartered in Ireland, and/or whose management (directors, shareholders or history) are predominantly Irish. – I must have about eighty companies to tackle here, and I’d like to do justice to each of them, so ongoing TGISVP posts will follow over the next few months. And note I’ll pick stocks in random order…just to spice things up! – For each stock, I’ll include a corporate/IR website link, generally the most active ticker (many have Irish/UK/even US listings), and link(s) to prior TGISVP posts, etc. which are definitely worth reading as additional reference. Note my exclusive focus on recent news/results & valuation, so I obviously encourage you to do further research on each company’s management, business & history. – Can’t STRESS this one enough: If I identify a stock as under-valued, it doesn’t necessarily mean I’d touch it with a barge-pole, regardless of upside potential…obviously, there are far more quantitative & qualitative factors to consider before buying a stock! – I’ll include an (evolving) TGISVP Excel file in each post with detailed figures & calculations – please feel free to review/agree/disagree with my assumptions, and/or revise valuations for your own personal use. I primarily use Last Twelve Months financials (see latest annual/interim results), ‘less I specify something different…if you can’t understand/confirm any figures, just comment/email me. – Most importantly, read my Disclaimer!!! Ultimately, this is purely a research exercise, and all valuations are necessarily rough & ready. Let me repeat: If I buy a stock, I’d perform far more detailed research first…you should too! However, if you’re bullish on the Irish market (yes, I remain bullish! ), this ETF (& its rivals) obviously represent a quick/easy way to gain exposure…albeit it’s large-cap exposure, as the top 5 holdings comprise almost 75% of NAV! At 2.05p per share, I tagged FRM as a ‘penny stock, which…could rally very nicely if it catches investors’ attention’. Little did I see it trading sideways for a year…only to transform, in a mere eight months, into a bloody six-bagger (hitting a 12.7p high). A typical case of small PIs losing their friggin’ minds! PIs got well ahead of themselves here…despite being sliced in half since the Jan high, FRM remains substantially over-valued. And if 6.25-7.25p support breaks, we’ll probably see another nasty shake-out. But the elevated share price may still be good news for management, as a substantial fundraising might be possible, which would help close the value gap here (as NAV would increase) – and with two well-known Irish politicians appointed since as directors, a new focus on Irish investors/projects wouldn’t be surprising, though Greater London residential also remains attractive. Kingspan’s firing on all cylinders… The transition towards more energy efficient buildings & building techniques – in both developed & (increasingly) emerging markets – provides an attractive secular growth tailwind, while relentless industry consolidation underpins an eat or be eaten strategy. Management capitalised on the company’s financial strength (as I’d expected) in late 2014, with an astonishing six month blitz of acquisitions. US/Canadian acquisitions propelled North America to 20% of total revenue, while buying Joris Ide rounded out pan-European exposure & delivered a 25% step-change in revenue. [Astonishingly, KSP still finished FY-2015 with net debt at just 1.0 times EBITDA]. With two acquisitions only closing in H1-2015, annualised H2 results offer a better run-rate, in terms of revenue/profitability. Kingspan’s now marginally under-valued – quite surprising for an outstanding growth story which offers an attractive combination of organic growth & a steady diet of acquisitions. Management’s discipline financing this growth is remarkable too – they’ve increased the outstanding share count a mere 6% in the past decade, relying instead on the judicious use of leverage. KSP’s never really been a cheap stock, but noting its balance sheet strength & capacity to generate cash, plus the white space still ahead (for example) in N America & the Rest of the World, the current share price & price target are well deserved. I wouldn’t be at all surprised to see them marching ahead together in the years to come. Well, that’s some piss-poor decision-making we’ve seen here in the last couple of years. I already described the €0.7 billion Cloverhill/Pineridge acquisitions as an overpriced & desperate attempt to maintain revenue/earnings growth, but investors suspended their disbelief for another year. The rot finally set in with the purchase of a 49.5% stake in Picard, for almost €0.5 billion – investors didn’t appreciate the diversification into a minority stake in a retail business which offered no real synergies, not to mention another substantial increase in leverage (albeit, mostly on a non-recourse/non-consolidated basis). The sale of Aryzta’s majority stake in Origin Enterprises (OGN:ID) (to help fund these acquisitions) also diluted EPS, while underlying earnings growth itself evaporated…clearly, this wasn’t what the average Aryzta investor signed up for!? Not surprisingly, the share price ended up sliced in half, as I’d predicted at EUR 63.15 per share. Aryzta’s actually fairly valued now – but investors have little to look forward to here in the short term. The CEO, Owen Killian, has dug a real hole for the company that’s gonna be painful to climb out of…and if that’s not enough, the fact he was abruptly forced to sell most of his equity stake to meet a margin call last month is more than reason to fire him on the spot. Bizarrely, the idiot board chose to replace his shares with fresh options instead, so he remains as a lame-duck CEO. But an eventual management reshuffle wouldn’t come as a surprise, nor would a classic kitchen-sink write-down…except that won’t help relieve Aryzta’s debt burden. The moral of the story: Don’t pitch yourself as a growth stock, unless you’ve got the numbers & strategy to back it up! Growth in the fertiliser game’s all about consolidation, whereas Origin’s been mostly all about divestment – fortunately, with Valeo now sold, only animal feed’s left as a potential non-core asset – with just €80 million spent on acquisitions in the past three & a half years. Time for a step-change… Overall, it’s a pretty stable core business, so management needs to start milking it for cash to return to shareholders (via dividends/buy-backs), or else accelerate growth by ramping up its leverage & acquisition pipeline/spending (more acquisitions, bigger acquisitions, or both…) – at this point, I’d still prefer a bet on the latter. So, Origin’s fairly valued here – plus we no longer face an over-hang, with Aryzta (see above) exiting its majority stake last year. Looking ahead, hopefully we’ve reached an inflection point, with management now fully focused on leveraging the core business. And Origin’s agronomy unit may be an intriguing wild card/kicker, as we see opportunities (& unicorns) blossom elsewhere in agri-tech/big data. Again, this depends on management…they still need to recognise the potential value in granting it more autonomy, rather than treating it as simply a fertiliser sales & marketing unit. I know the biotech/medical device sectors have (generally) been ultra-popular, but I still struggle to understand why investors would buy MSTY over the last couple of years…cash burn’s high, but progress has been pretty slow. Granted, Australian/European clinical trials have produced clinically important/statistically significant results, ISO certification has been obtained, and hopefully we’ll see CE Mark approval soon enough – but enrollment’s only beginning for US trials now, so potential FDA approval’s still a couple of years away. Yup, I now peg MSTY’s value at zilch, nada, kaput… Hark, I hear the shareholders spluttering with outrage – what about the value of its intellectual property, the possible revenue opportunity, a potentially generous acquirer, etc?! To which I’d reply, what about the interim cash burn, the risk of regulatory/commercial failure, the potential dilution to come, the debt-related risk, etc? I’d particularly highlight the latter: To see a zero revenue/cash burning company draw-down debt (at a huge credit spread) inspires zero confidence in management, and clearly signals shareholder value isn’t the No. 1 priority here. Yeah, I know: Kerry has an incredible growth trajectory ahead as it migrates from Consumer to its higher margin Taste & Nutrition business, cranks up its acquisition machine, benefits from increasing economies of scale, yada yada. But that was the pitch five years ago, and also ten years ago…how much longer will investors ignore actual feedback? At this point, they’d do well closing their ears (to the story) & opening their eyes (to the actual figures). Kerry is ridiculously overvalued, a dangerous blue chip if I ever saw one…not that I’ll persuade many of its devoted fans. But the greater the multiple & blind faith it enjoys, the more it risks being felled, if/when an abrupt change in sentiment finally hits…as we saw with Aryzta. Which doesn’t mean I’d necessarily advocate KYG as a short – many of its shareholders are buy & hold types, who are pretty oblivious to price & valuation, so it might require really serious/unexpected bad news to actually provoke a crisis of confidence. Or perhaps the shares end up trading sideways for years on end, with buyers slowly drifting away…if so, and shareholders think my call on Kerry was wrong, they’re bloody welcome! Hibernia’s NAV has appreciated nicely in the last couple of years, and it managed to pull off a substantial €300 million follow-on placing. Highlights in the past year include significant pre-lets to Twitter at €50 psf & HubSpot at €45 psf, the fit-out & rental of 213 residential units in Wyckham Point, Dundrum (for €3.7 million pa rent), EPRA Index inclusion, and internalisation of the investment manager. And with €63 million of cash & zero leverage outstanding at year-end 2015, the company has plenty of reserve firepower. Hibernia’s fairly valued. In fact, Irish property stocks have taken a breather for the past year or so, but accelerating (& now sustainable) Irish economic momentum would suggest further NAV appreciation ahead. Noting Hibernia’s mixed investment mandate, I suspect we’ll see a larger residential allocation in due course…considering the overwhelming supply/demand imbalance that’s now emerged (inexplicably) from the vast post-crisis surplus of residential stock we were wringing our hands over not so long ago. Looking ahead, sector performance will increasingly depend now on property management & development skills, and on raising dividends towards average global REIT yields. Fyffes bounced back nicely in the past year & a half, after being dumped at the altar by Chiquita shareholders (who voted instead for a Cutrale-Safra cash offer). While revenue was basically unchanged in 2014, adjusted EBITA/diluted EPS jumped 23% & 27% respectively. Growth continued in 2015, with revenue up 12%, while adjusted EBITA/diluted EPS were up another 14%. This was capped in early April by the C$145 million acquisition of Highline Produce, Canada’s largest mushroom producer. Well, the drama’s over at INM, new management’s been installed, and now the balance sheet’s relatively clean…but I’m a bit stumped as to what happens next. The company’s restructuring & sale of its APN News & Media (APN:AU) stake has eliminated all debt, and left the company with €60 million of (surplus) cash. Just as importantly, there’s finally a step-change in cash generation – with capex, exceptional expenses & negative working capital all declining. Unfortunately, revenue’s still dead in the water, with circulation declines offsetting ad growth & no real sign of change – management’s still touting strong digital ad revenue growth, but it’s a total red herring since it comprises a mere 4% of total revenue! Obviously, a radical revaluation from my EUR 0.114 Price Target two years ago, reflecting the benefits of financial restructuring & improved cash generation – leaving INM looking substantially under-valued now. Denis O’Brien (with a 29.9% stake) & Dermot Desmond (a 15% stake) are in the driving seat here – both have an obvious eye for value, but are primarily growth-oriented investors/entrepreneurs. And neither appears to harbour any illusions INM’s some trophy asset (as so often happens with billionaires & media properties) – in fact, the exact opposite may be true, with both very keen on staying out of de papers..! So, does this mean INM: i) ends up being run (PE-style) as a declining but still locally dominant business, with cash generation & return of capital being maximised (particularly interesting in light of the current share price discount vs. intrinsic value), ii) becomes a potential media/technology platform for new acquisitions/growth, or iii) ends up for sale, or even an O’Brien/Desmond bid target, noting the company’s dramatically improved financial situation & valuation? Certainly a good question…and maybe a good bet too!? When can we expect part 2? Hopefully Total Produce will be in it. Do you see FFY & TP becoming one again? Pure coincidence, but your wish….! Any thoughts or views on PVR ? I’m tackling all these stocks in batch/random order, so I’ll get to $PVR:LN in due course…stay tuned! As detailed above (and also see previous DCC notes/commentary I highlighted), the (3,078 M Rev * 1.125 P/S) comes from H2-2015 revenue run-rate & an 11.3% trading margin (an average of current 9.4% margin & peak 13.3% margin, as I’m pretty confident KGP will re-attain this peak margin again). The 212 M cash comes straight from the latest balance sheet. As it stands, KGP/shareholders effectively earn nothing from this cash – but if this cash, for example, were returned tomorrow morning to shareholders, there’s no reason to believe that would negatively affect Kingspan’s P/S multiple (or its financial strength), and shareholders would have an additional 212 M cash to re-invest (or invest elsewhere). [Or spending the money on an acquisition would obviously produce a more attractive return also]. I adjust my valuation accordingly. The same logic applies re debt capacity – a strong company like Kingspan could draw down significant debt (at a low interest rate) for an acquisition tomorrow, which would hopefully significantly enhance earnings & the value of the company/share price, with no significant impairment to its overall financial strength. Again, I’d adjust my valuation accordingly…this will rightly distinguish the valuation of strong companies from weak companies (and I penalise weak companies accordingly – see Aryzta, for example). However, I’m also aware: i) management may never actually draw down this debt capacity (for acquisitions, share buybacks, investment, etc. ), ii) additional acquisitions/investment also present risks, iii) net & gross cash/debt may be very seasonal, etc. – so in my book, it’s prudent to haircut this debt adjustment by 50% to allow for these risks (of course, if it’s a negative debt adjustment, prudence will generally dictate no haircut). As I’ve highlighted b4, Origin Enterprises $OGN:ID tested €6.15-25 twice in past 6-7 mths…break cd see €5.00…today might be challenging. Wex hi. Great start to a well loved project, thanks! Can I ask one very small question? For Kingspan I see EUR212M on their balance sheet and you’ve counted the whole lot after having noted you’re adjusting for surplus cash – how are you judging here what’s surplus and what isn’t? Their inventories and receivables just outstrip their payables so without getting too cute, that should all net out over the next 12 months and all things being equal you’ve still got the 212 – is that your thinking? Would you be less generous if there was a big working capital deficit? If I adjust for surplus cash, I’m looking at the overall financial strength of the business – so I would check: i) balance sheet cash isn’t a once-off/seasonal (cash avgd €189 million in the last year), ii) agreed – working capital appears healthy/stable, iii) there’s no serious cash flow shortfall vs. earnings, and iv) all debt metrics are healthy. All these look good for Kingspan, so if they utilised their ‘surplus’ cash on an acquisition (for example), I see no risk/impairment to the business (& no impact on their usual working capital cycle) – and obviously the return for shareholders should be far superior to an effective zero rate on idle cash! Also note, when I adjust for surplus cash, I’m usually adjusting for additional debt capacity too – but I generally haircut this figure by 50%, so that will provide some reasonable wiggle room on my cash/debt adjustments. You’ll note I also included cash & debt adjustments for Origin, for similar reasons, but included no cash adjustment for Kerry & (particularly) Aryzta as their numbers & financial strength don’t stack up as well. Thanks Wex. I had actually noted your different adjustments regarding cash amongst the different names you covered. I always try to think carefully about haircutting cash and find myself wincing a little at EV calcs that always just slap on every last penny but your explanation on Kingspan is very clear and to be honest, makes sense. As an aside, I’m the one that was interested in how you’d look at a 2.0 company full of R&D, amortisation and (whisper it) stock based comp… and seeing as you’re now up to the big 25 on Twitter, *that* would be a fascinating Desert Island Disc of a valuation…! Yes, I use what might be described a bastardised EV analysis with many stocks…and I prefer my approach as it really forces me to focus on each component, esp. cash & debt, as a separate/distinct analysis (rather than some rote/default EV calculation). Obviously, that’s something that should be part of your investment checklist anyway, for any stock, but this is a great way to make it integral to your (valuation) analysis. I’m actually relatively comfortable with Twitter’s valuation at this point, from an EV or a value-per-user perspective. I’m even comfortable with the user base, even if it no longer grows (as quickly) & remains a fraction of the $FB user base – it’s silly to presume a smaller audience than $FB is a failure, different platforms/networks will obviously have a different reach & an ultimate value-per-user (which isn’t necessarily related to size, above a certain minimum critical mass). [And let’s not forget: $FB user base growth must & will obviously come to a grinding halt in the not-too-distant future]. So the real challenge, as usual, is anticipating/forecasting the growth, monetisation, execution, existential risks & opportunities ahead for Twitter!?! I am very happy to see you back in this outstanding project. Good luck to you and to us, your readers! Thanks, Max, and good to hear from you!